Studies have shown that increased exposure to Radon gas in the home or workplace has now become the second leading risk factor for lung cancer among smokers and it has become the leading risk factor among non‐smokers. The World Health Organisation Handbook on Indoor Radon has clearly indicated the magnitude and proliferation of radon exposure as a public health concern that has serious short-term and long-term implications. 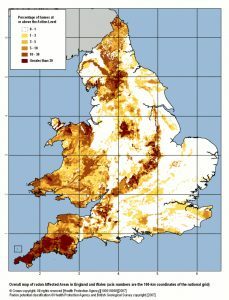 According to the National Health Service, exposure to this radioactive pollutant, Radon gas accounts for approximately 1,100 fatalities due to lung cancer. The current problem is that many people, firstly don’t understand what Radon is and they also don’t understand the implications of continued exposure. Radon is a naturally occurring radioactive gas produced by the breakdown of uranium-238 found in the earth’s crust. This gas will usually harmlessly escape into the atmosphere, however, in modern airtight buildings the Radon gas can build up and when inhaled it can increase the risk of lung cancer. The concentration of radon in some parts of the United Kingdom is significantly higher than the UK’s target limit of 100 becquerels of radiation per cubic metre. The BRE Report BR211 Radon: guidance on protective measures for new buildings, has given developers a set of guidelines to ensure that any new builds have been protected against Radon ingress. But Radon does not just affect new builds, existing buildings can be affected as well, but if found the levels of Radon can be reduced therefore lowering the risk of lung cancer. As active members of the UK Radon Association, the European Radon Association, the International Radon Measurement Association, and the British Geomembrane Association GeoShield focuses on proactive consulting, testing, and validation of radon protection measures and are developing Radon testing and Verification programs for both new builds and existing properties. Their GSR+ QA program incorporates relevant material from the BRE Report BR211 Radon: guidance on protective measures for new buildings, independent testing and follow-up test results, a validation certificate, and an evaluation of subfloor ventilation methods such as radon sinks. The program also incorporates the stringency of the CIRIA C735 standard and practice for the testing and verification of gas protection systems. The goal of this program is to improve the long-term detection, validation, response, and protection capabilities in areas of high radon concentration.